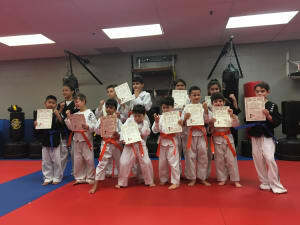 Congratulations to all our warriors for doing a great job on their promotion test this past Saturday! They did amazing showing their knowledge of the material. Hats off to all the Instructors and Assistants who prepared them and thanks to all our incredible parents for their support and encouragment. The Beginners will now be moving on to Block 1 and will be scheduled to be promoted again in March 2018. Date and Time TBA. It is with great pleasure to invite all Orange Belts to now enroll in the next level of their training in our Black Belt Club program.